Thorcon Power is based on a straightforward scale-up of the molten salt reactor that ran for four years during the Molten Salt Reactor Experiment at Oak Ridge (1965-1969). Everything in Thorcon’s plan is directed at realizing low-cost electricity on the shortest possible term. In their proposal Thorcon shows what you get when you combine proven nuclear technology with proven shipyard manufacturing logic. Their biggest challenge seems not to be in the technical feasibility of their ambitious plans, but in getting regulatory authorities ready for a radically different approach in nuclear development. On Thorcon’s site, you’ll find this interesting page that explains how different building processes can be by comparing the building processes of two ships. One is a special delivery for the US Navy, the other is a tanker ship needs to operate in the highly competitive market of oil transport. So far, almost every nuclear power plant has been built as a ‘special delivery’. Thorcon wants to build nuclear reactors the way it builds it double walled oil tankers in such a way that they can compete in the real world. It is a lengthy proof that explains a simple point: low cost is something you can design for. They quite convincingly build their case for the feasibility of nuclear low cost electricity. Before talking about how shipyard productivity could impact the building cost of nuclear power plant, we’ll have to take a look at the core component, the reactor. Serious estimates of how much time we need before we can actually build and use molten salt reactors are usually made in decades. But all these estimates are based on the assumption that we are going to need a design and materials that can withstand virtually unattended operation for about 40 years. The Molten Salt Reactor Experiment of the 1960s has already shown that a molten salt reactor can operate very safely for four years. So here’s the idea: use the design and materials that were used in the 1960s. And change the key components every four years or so. Based on these principles, Thorcon thinks it can have a working power plant in 5 years. The ‘swappable’ unit of ThorCon is called the Can, which contains the reactor vessel that is called the Pot. The other components in the Can are the pump and the heat exchanger and the freeze valve. After four years of operation the Can will be decontaminated and either refurbished or recycled. 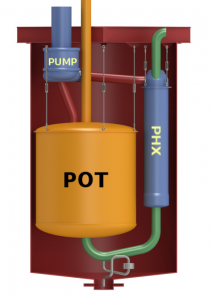 A Can includes a Pump, A Pot (reactor) and primary heat exchanger (PHX). One Can produces 557 MW of heat, which is turned to 250MW of electricity. The high efficiency (44%) is made possible by the high outlet temperature of the Pot (705C). Each Can is located within its own silo, about 30 meters underground. Each Can is also sealed from the environment by four gas tight radiation barriers. A complete power module of 250MWe has two silos with room for two Cans, one in use and one in cooling-down or standby mode. The setup operates much like a duplex filter, a module in which one filter operates while the other is being serviced, replaced or in standby. A complete power plant can consist of one power unit to as many power units as are needed. All of the design is aimed at continuous operation, based on a modular or ‘block’ approach. A complete 1GWe power plant will consist of four power modules, that are arranged as one long silo hall, that can be serviced by a single 500 ton bridge crane. The people behind Thorcon have put some serious 3D designing in their plans, as can be seen in this animated construction scheme. The leading idea is to mass-produce all components. Thorcon shows how this can be done, using existing knowledge and skills. It is also Thorcon’s conviction that the existing knowledge and skills that are required to successfully operate a shipyard can and need be applied to successfully operate a plant that builds nuclear power plants. Once the design of the Can and the Power Unit are settled, there is no reasons why shipyard rules cannot be applied to nuclear power plants. In fact, Thorcon’s philosophy requires that these rules be applied. Thorcon is sure that this approach will supply energy cheaper than coal. As anyone with extended experience of certain processes knows, given enough time to develop routines, certain ratio’s show up that describe how much time is needed to do good job. A good shipyard needs about 5 man-hours to cut, weld, coat, and erect a ton of hull steel. The yards achieve this remarkable productivity by block construction. The very same principle can be applied in the case of building nuclear reactors. Based on those premises, Thorcon calculates that their power should cost less than 3.5 cents per kWh. Coal, assuming particulate control and desulphurization but no attempt to capture CO2, will cost at least 5 cents per kWh. But the Catch 22 of the licensing procedure is far from being resolved. Thorcon’s plans and proposals at best have served as letters of protest to the current licensing regime in the United States, but have not brought the company the dialogue about the licensing procedure that is dearly needed. On his blog ‘Atomic Insights’, Rod Adams offers a plausible explanation: Indonesia needs the income of the natural gas it could sell once its oil sector is further developed. Whatever the explanation is, Thorcon’s efforts to get a nuclear business going reveals where the real problem in the western world is with regard to nuclear energy: the licensing procedure is simply hostile to any effort to innovate our way towards a prosperous and carbon free energy future. However, things seem to have finally started moving even on the bureaucratic front. Almost on the day that Thorcon signed its MOU with Indonesia, the White House announced remarkable steps that may mark the dawn of new hope for nuclear innovation. An innovation which is dearly needed if we want to realize a fossil fuel free future, a vision that is adhered by a growing number of well-informed thought leaders, like James Hansen, Stewart Brand and Brian Eno.